As I noticed all the soybean and cornfields in the area I thought capturing images of the farmers harvesting those crops would make for good photos shoots so I set out to find the harvest in action. 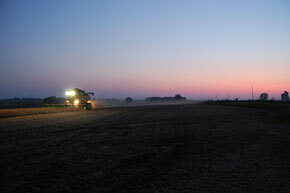 It didn’t take me long to find my first shoot…a combine harvesting a soybean field right next to a country road. 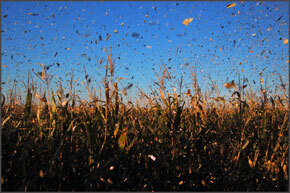 I started getting shots and was close enough to the action that I was sprayed with soybean dust from the combine…I was hooked! I introduced myself to the farmers so they knew what I was doing there and they were very receptive and explained the harvest process to me. They told me where they would be the next day…I found them on that Saturday and got some more harvest shots. I wanted to find farmers in the cornfields so I headed out after work on a Friday and found my second harvest shoot. Again, the farmers were receptive and this time invited me to ride along in the transport truck that was being filled with corn by the combine in front. The driver of the truck was a young man here in the United States from South Africa. He was here farming for six months and was headed back home after the corn harvest. I was able to get a few good shots from inside the truck but the ride was bumpy so that limited my shooting. I stayed in the cornfield until sundown getting shots. The hike back to my car was filled with an orange and dark blue sky on the horizon and a full moon starting to shine and as I stood in that cut corn field I felt so serene…it was beautiful! My last shoot of the harvest season was west of town and I captured the shot I had envisioned from the beginning…a combine in the field on the horizon at sunset. What a perfect way to end my harvest adventures!